The Avenuida del Paral·lel or the Parallel Avenue runs from Plaça de Espanya to the sea, spanning for around 1.5 miles, and it’s one of Barcelona and divides the Ciutat Vella, Eixample and the Sants-Montjuïc areas. Now, you may be wondering about its rather strange name, well it comes from the fact that this road is the only road in Barcelona, which is parallel to the Equator. The Paral·lel Avenue is extremely well located, running through the heart of Barcelona, and due to this there’s just so much to see and do! The Maritime Museum and the Monument a Colom to the south and the Parc de Joan Miró to the north. But, such a great location does lead to some problems, perhaps the worst kind of problems.. parking problems ;) The centre of Barcelona is divided into two zones, the blue zone and the green zone, the green being just for residents and the blue zone having a maximum parking time of 4 hours.. plus you have to pay, so it really isn’t ideal for exploring the Catalan Capital. But, don’t despair, Parclick offers the perfect solution - book your parking in advance, and know that before you even set off that you’ll have a space reserved just for you! Just take a look at the map to see which car park suits you! 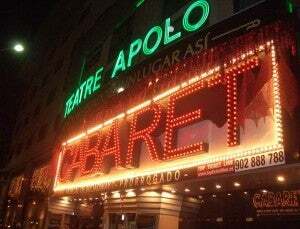 Since the end of the 19th century, the avenue has been packed with theatres, cabarets, music calls, cafés - the works! So it soon became a really bohemian and artistic area, with a super chill atmosphere, almost like Montmartre in Paris. Nowdays, the area has undergone some renovation works, in order to bring it into the 21st century, so theatres have been renovated, pavements have been made wider and cycle lanes have been introduced, but the atmosphere still remains! Here, you really are in the heart of Barcelona, by day you can see the museums, squares, shops and restaurants in the area, and at night you can enjoy the theatres and music halls. Plus, you’ll find the Poble Sec metro station located halfway down the street. Plus the Museu d'Arte de Catalunya is just a short walk away too!